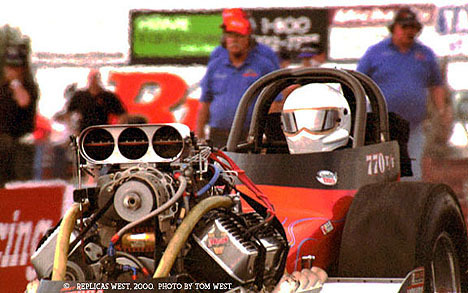 Drag Racing Picture of the Day! Here is Tim "Casper-the-Friendly-Ghost" Gibson leaving the line under full power with the MasterCam nostalgia fueler in 2000. We really have to insist that Gibson get that helmet painted. Talk about a retro look, that is one that I can do without. I have a book full of white-helmet dragster shots from the old days that are unidentifiable! Copyright 1996-2014 by Bilden Enterprises. All rights reserved.